Monday 1st April – Australian Market Wrap | Beeks Downunder-Because not all financial news is boring! ASX 200 up 36 to 6217 after a jump out of the blocks at the opening. US futures showing a 168 point gain helping sentiment.Rally cools though ahead of RBA and Budget tromorrow. WOW buy back worth $1.7bn adds to reasons to be cheerful, runs 2.2%. RIO up 1.65% calls ‘force majeure’ on some Pilbara ore production as now looking for FY production at lower end of the range. FMG +4.5% again. Banks post gains for a change, led by CBA up 1%.MQG up 0.9% to an all-time high. Bond proxies and REITs take a time out with GMG -1.3%. Asian markets firm and AUD up to 71.22c ahead of crucial day tomorrow. ASX 200 finishes up 36 to 6217 on stronger regional markets. Off highs. Miners lead ASX higher. Iron ore the star. Metals and mining index at 7 1/2 year high. Banks gain some strength for a change. Healthcare up. Bond proxies go sideways. Amazon .com.au loses $5.3m after tax in Australia. Asian markets strong with Japan up by 2.04% and China puts on another 2.31% on positive PMI data. ECX +16.41% SIQ special cheers sector. TWE +3.01% signs of life on China hopes. TCL -0.68% CEO sell down. JIN +3.32% good bounce from oversold position. KGN +8.19% tech rally in US helps. CLV +3.86% feeling the love on omega 3. WGN -4.82% cementing its weakness. APT +6.87% screams higher. Now $5bn market cap. PE is now 3743. Speculative Stock of the Day: Uniti Wireless (UWL) +26.09% another non-binding highly conditional fingers crossed bid for the company from Spirit Telecom (ST1). No more information as to price and conditions. More to come soon. Biggest Rises: SHV, APT, BGA, AAC, AVH, SPO and Z1P. Credit Corp (CCP) – Has announced a fully underwritten institutional placement to raise around $100m and a non-underwritten SPP to retail shareholders in Australian and New Zealand which aims to raise another $10m. Proceeds to provide balance sheet flexibility and improve the group’s strategic position. FY19 guidance reaffirmed. The issue price for the institutional placement represents a 7.8% discount to Friday’ s closing price at 2045c. Woolworths Group (WOW) +2.24% Completes previously announced Petrol sale, the sale will likely result in a $1.1bn gain after tax for FY19. WOW announces $1.7bn off-market buy-back. BIG W trading update, the division is currently expected to report a loss before interest and tax in FY19 of between ($80m) and ($100m) vs year-ago ($110m). Woolworths will also shut around 30 BIG W stores over the next 3 years. Smartgroup Corp (SIQ) +3.66% Declares a special dividend of 20c per share. Thorn Group (TGA) – Lowers FY profit guidance to ($8m) vs prior guidance of ($6m), following increased arrears and write-offs in the company’s consumer leasing business. The company has also started a review of its strategic options. Charter Hall Retail REIT (CQR) – To acquire Rockdale Plaza for $142m. CQR will undertake a fully underwritten $150m institutional placement at 451c per unit. A UPP will also be offered to eligible shareholders, the UPP will not be underwritten and is expected to raise up to $10m. CQR reaffirms FY19 operating earnings growth of 2%, in line with its previous guidance. Bubs Australia (BUB) –1.24% Enters into a conditional sales and purchase agreement to acquire infant formula producer Australia Deloraine Dairy for $35m. Executive Director John Gommans to also retire. Zip Money (Z1P) +5.26% Westpac Bank has exercised its top up rights to Z1P putting in another $8.9m for an additional 5.812m shares. The company recently raised $42.8m in a placement. SPP closes 11th April. The AIG Australian Performance of Manufacturing Index declined to 51 in March, from 54 in February. The reading pointed to the weakest expansion in factory activity in three months. The national CoreLogic home value index fell by 0.6% in March, the smallest decline since October last year. CBA Australia Manufacturing PMI Final (March): 52.0 points, down from 52.9 points in February. NAB Business Survey (March): Conditions +7 points, up from +4 points in February; Confidence 0 points (3-year low), down from +2 points from February and missing market consensus of 4. Expect a kitchen sink budget tomorrow night. The Caixin China General Manufacturing PMI rose to 50.8 in March, up from 49.9 in February, and above market expectations of 50.1. It marked the first increase in the manufacturing activity since November last year. A manufacturing gauge for south-east Asia returned to growth in March. Theresa May is thinking of putting her cunning plan to the Parliament again.Fourth time lucky. Dreaming. Accept the only deal or face a long delays says EU. Deutsche Bank has discussed raising up to EUR10bn for its Commerzbank merger plans. 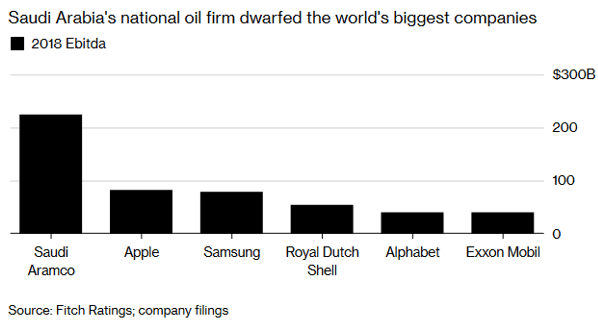 Saudi Aramco was the world’s most profitable company in 2018. EBITDA of US$224bn. Critical Thinking At Its Best! So a beer costs $5 and you have 3 beers a day which puts your spending each month at $450. In one year, it would be approximately $5400 correct? Where’s your f……… Ferrari then?